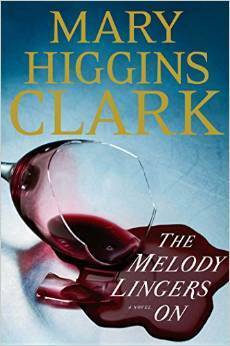 Today I'm featuring Mary Higgins Clark's latest suspense novel, which I picked up from the library yesterday and will be reading over the weekend. Beginning: Thirty-year-old Elaine Marsha Harmon walked briskly from her apartment of East Thirty-Second Street in Manhattan to her job as an assistant interior decorator fifteen blocks away in the Flatiron Building at Twenty-Third Street and Fifth Avenue in Manhattan. Page 56: "The friends he had carefully chosen years ago completely accepted him for what they thought he was, a rather shy man, a widower who loved sailing." My thoughts: I'm an avid MHC fan, and always await her next novel. Her stories are usually set in New York City and/or New Jersey, and I enjoy the references to places I've visited. The Flatiron Building is a famous NYC landmark that houses the offices of Macmillan Publishers, which I have visited several times. From Goodreads: As the sole assistant to a famous upscale interior designer, Lane Harmon, mother to five-year-old Katie, is accustomed to visiting opulent homes around the tri-state area. A born optimist, Lane finds the glimpse into these gilded worlds fascinating, and loves the reward of exceeding the expectations of their often-demanding owners. When she is called to assist in redecorating a modest townhouse in Bergen County, she knows the job is unusual. Then she learns the home belongs to the wife of a notorious and disgraced financier named Parker Bennett. Lane is surprised to find herself moved by Mrs. Bennett’s calm dignity and apparently sincere belief in her husband’s innocence. Gradually, Lane finds herself drawn to Mark, the Bennetts’ son, who is similarly determined to prove that his father is not guilty. Lane doesn’t know that the closer she gets to the Bennetts, the more she puts her life―and her daughter’s life―in jeopardy. Friday Focus: The Friday 56 & Book Beginnings #83 was originally published by Catherine for bookclublibrarian.com. This post cannot be republished without attribution. Retweeting and sharing on Google+ are encouraged and appreciated.